São Paulo/Guarulhos–Governador André Franco Montoro Internaitional Airport (IATA: GRU, ICAO: SBGR), popularly kent locally as Cumbica Airport efter the destrict whaur it is locatit an the Brazilian Air Force base that still exists at the airport complex, is the main airport servin São Paulo, Brazil. It is locatit in the municipality o Guarulhos in Greater São Paulo. Syne 28 November 2001 the airport haes been namit efter André Franco Montoro (1916–1999), umwhile Govrenor o São Paulo state. The airport wis rebuistit as GRU Airport in 2012. In Brazil the airport wis rankit first in terms o transportit passengers, aircraft operations, an cargo handled in 2012, placin it as the busiest airport in Laitin Americae bi passenger traffec (36,000,000 in 2013). Guarulhos haes slot restrictions, operatin wi a maximum o 45 operations/oor an bein ane o the five airports wi sic restrictions in Brazil (the ithers are São Paulo-Congonhas, Brasília, Belo Horizonte-Pampulha an Rio de Janeiro-Santos Dumont). Syne 2012, the airport haes been operatit bi a consortium componit o Invepar S/A, Airports Company South Africa, an Infraero. Some o its facilities are shared wi the São Paulo Air Force Base o the Brazilian Air Force. The Tropic o Capricorn goes directly throu the soothren tip o the airport. ↑ "São Paulo–Guarulhos International airport - Economic and social impact". Ecquants. Retrieved September 7, 2013. ↑ "Movimento operacional da rede Infraero de janeiro a dezembro de 2012" (PDF) (in Portuguese). Infraero. January 14, 2013. Retrieved January 16, 2013. 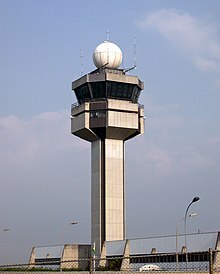 ↑ "Sao Paulo/Guarulhos International Airport". Infraero. Retrieved April 29, 2014. ↑ "Lei n˚10.314, de 28 de novembro de 2001" (in Portuguese). Lei Direto. November 28, 2001. Retrieved August 8, 2011. ↑ Dores, Kelly (November 27, 2012). "Aeroporto de Guarulhos adota nova identidade: GRU Airport". propmark (in Portuguese). Editora Referência. Retrieved April 29, 2014. ↑ Komatsu, Alberto (16 March 2010). "ANAC vai por limite de pouso e decolagem em mais seis aeroportos" (in Portuguese). Valor Online. Retrieved March 19, 2010. ↑ "Anac restringe pousos e decolagens". Revista em Discussão (in Portuguese). Senado Federal (Brazilian Federal Senate). November 2010. Retrieved 2013-09-18. ↑ "Invepar Website". Retrieved November 17, 2013. ↑ "View of São Paulo-Guarulhos airport centered on the Tropic of Capricorn". Google Maps. Retrieved July 29, 2011. Wikimedia Commons haes media relatit tae São Paulo-Guarulhos International Airport.